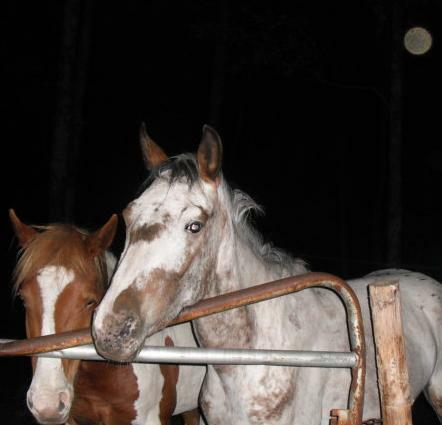 So here is Ponder in the moonlinght -- what a great photo, yes, that is really the moon in the upper right. It looks like her question mark marking(see previous posts of her as a twoish-year-old, a yearling, and weanling) is destined to be a mark of her youth. Roans are pretty too, Ponder :-). WOW...looking at her baby pics, I would never have guessed she'd end up roaning out! She is quite a cutie! That's the fun of owning an Appy. You never know what color horse you'll own when they shed out in the spring. My mare develops new spots every year. That's why it's good to keep updated photos just in case they go missing/stolen, too.